← It’s such an honor to even be nominated……. Cold, Clooney, Culture, and Cheese. Is it really already Thursday again? The days fly by too fast- just as they did at home. Forget everything I said about how mild the winter has been and how much I am loving the cold. The Big Chill has descended upon Paris and man is it cold! Fortunately, the sun has been out and the wind has been pretty calm, but today was a bone-chilling 16 degrees when I took my first walk. We’re all super-excited that it’s supposed to warm up to a balmy 28 this afternoon, though. Woo hoo- break out the lawn chairs! Sawyer picked this cold snap to insist on going out at 2:00 AM one morning this week. Oh to be able to open the door and say ,”SO GO THEN!”. No, I had to put on my slippers, wrap my coat around my flannel pajamas, put him on the leash, and go downstairs. I tried to talk him into using the inner courtyard, where the trashcans are, but even he has his limits, I guess. We had to go out onto the street, where he then felt compelled to sniff around for almost ten minutes to finish the job. Anyone want a dog? Mark is out of town, so I thought it a good time to go see my second favorite man, George Clooney. Yesterday morning my friend and I were two of four people at the 11:10 AM feature of The Descendants. The theater was really nice but was so cold we had to keep our coats on throughout the entire film. How come no one warned me how sad that movie is? Whoa. After the movie I had just enough time to run home, put on my silk long-johns (which I could have used in that frigid theater), eat lunch, and then walk up to one of my favorite museums for a tour. The Musee Nissim de Camondo is a mansion built in 1911 by Count Moise De Camondo, who was a wealthy Jewish collector of 18th century art and furniture. * He hoped to live there with his son and daughter, but sadly, his son Nissim was killed in World War 1 shortly after the family moved into the house. Tragedy continued to follow this family as his daughter and her entire family were later killed at Auschwitz. 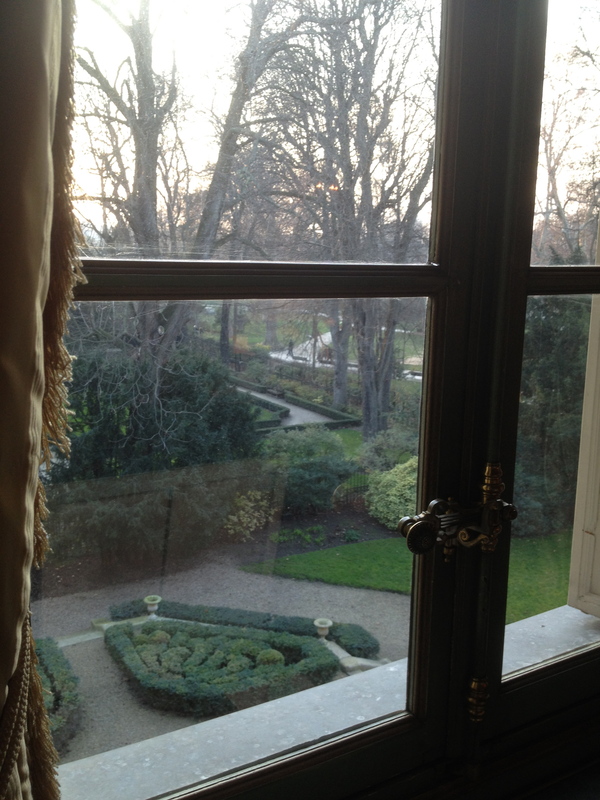 The house and collections were bequeathed to Les Arts Decoratifs and opened as a museum in 1935. The mansion was modeled on the Petit Trianon at Versaille, but was built with the most modern conveniences available at the time. It has the first elevator to be installed in a Paris home- don’t you know everyone wanted to ride in it? It also has some of the very first flush toilets with a flush button rather than the “pull” mechanism. The Count was one of those rare people whose taste was in direct proportion to his money- he could afford the very best , and he wanted only the very best in his collection. He stipulated that the house must remain just as it was when he lived there. No furniture or art may be moved or loaned, and none can be added. The result is an amazing example of how a wealthy family in the first part of the 1900’s lived, and how a well-appointed house in the 18th century would have been furnished and decorated. Another interesting unwritten but enforced stipulation was that no mention was ever to be made of the Count’s ex-wife and mother of his children, from whom he was divorced. Sounds like there might be a spicy story there, yes? 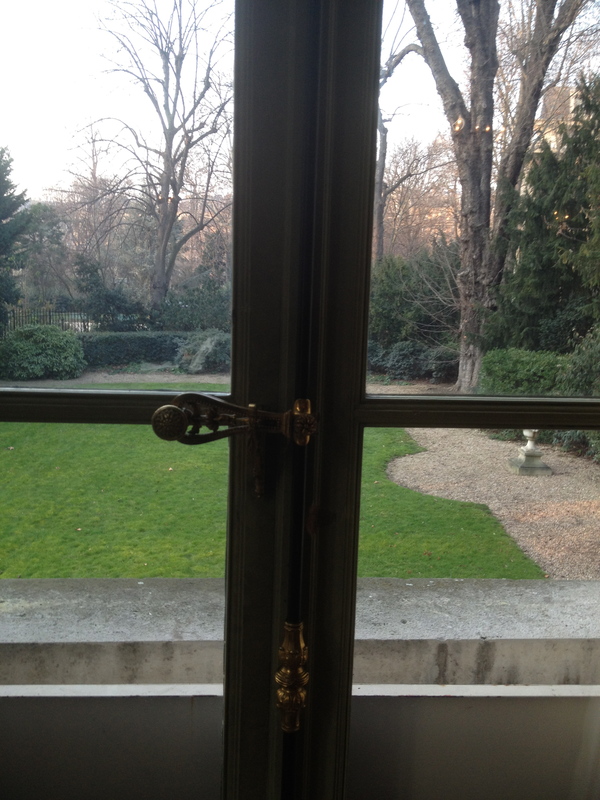 A special bonus for me is that the mansion is built on the border of my beloved Parc Monceau, so I can look out the windows and imagine what it would be like to live in one of the apartments I frequently admire as I wander through the park. 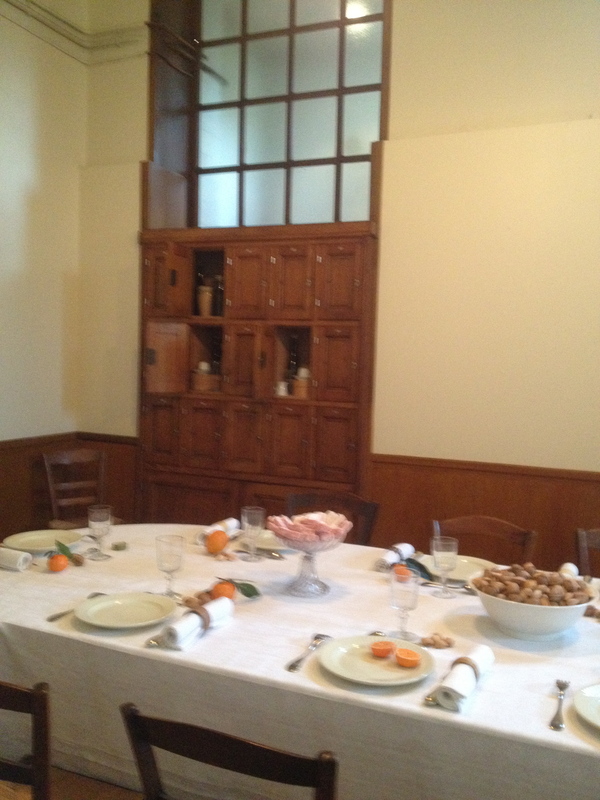 The dining room for the staff, with their lockers in the background! Finally, I know you will all be relieved to know that today I finally located the source of the mysterious vomit smell in my kitchen. Remember those two packages of mozzarella balls that I thought I had bought at the store but weren’t in my little rolling cart when I got home? No, of course you don’t, because I am not yet desperate enough to blog about such things. But that was last Friday. Today, Thursday, I followed my nose to said little rolling cart and located the missing cheeses, which had finally exploded in their packages, releasing a vile and penetrating stench. I have removed the cart liner and thoroughly wiped it out, but am skeptical that I will ever be able to rid it of the lingering odor. Aren’t you glad I didn’t take pictures? And on that stinky cheese note, I will leave you. My dear friend from home arrives tomorrow (if she isn’t frantically trying to change her ticket after reading that last paragraph), and I am hopeful that we will find some things to do that will interest you. Stay tuned! * My initial interest in this house was sparked by a wonderful book I read when I first arrived here,The Hare With The Amber Eyes, by Edmund de Waal. This book is about another wealthy Jewish family who lived just down the street from the Camondos at that same horrifying time. I recommend it highly. Meanwhile, it is a balmy 66 here in H-town, with a high of 77 today. Sticky, sticky, ugh. Of course, Dave would had probably eaten that stinky cheese. That was his favorite thing when he used to travel over there so often- finding a cheese shop and enjoying some stinky whatever. Stay warm. Um, no, I don’t think he would have eaten this stuff. It wasn’t meant to be stinky! I don’t miss the sticky (as opposed to the stinky) of Houston one bit. My hair has been delightfully straight this week! Vinegar? Lemon juice? Try them to see if they will get rid of the stinky cheese smell. Heloise swears by vinegar – for everything! I will try them for sure. I use vinegar a lot, myself. Here they sell what is called “alcohol vinegar” as a cleaning product, although it is stocked with the vinegars and no doubt trips up some naive ex-pats each year! So nice to hear from you, Kathy! I wondered if you were in Houston over the holidays- hoped I would bump into you somewhere. I think you will like the book- let me know! 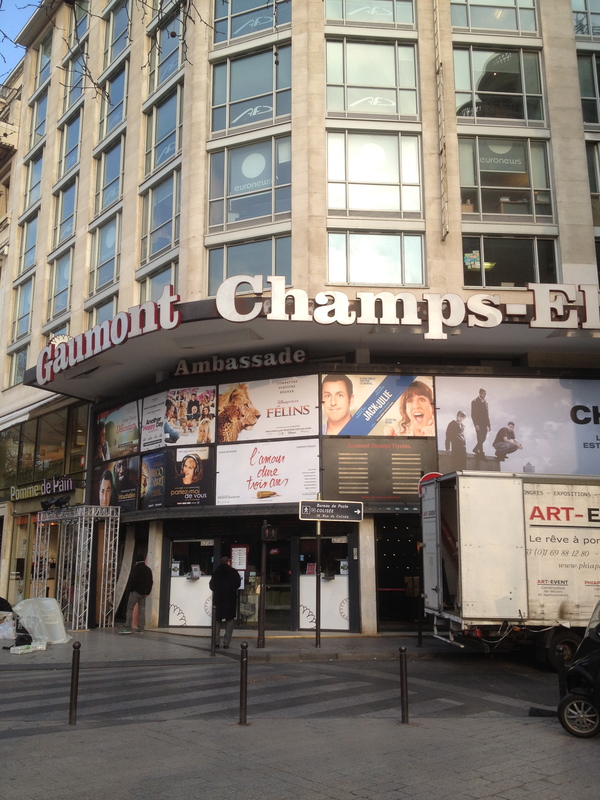 Thanks, Kate, for introducing us to another Paris treasure. I guess you could not take pictures inside. Try to stay warm and have fun with Martha! Actually, I didn’t take any pictures because I thought I already had them on my computer from my last visit. TUrns out I took them on my mom’s camera and she hasn’t sent them to me. I may do an updated post when she gets them to me. The kitchen was amazing….. Loved the pics! That museum sounds really cool. Speaking of which may I recommend buying some microfiber long johns and perhaps some of those fantastically warm and ugly woolly socks they sell at Academy?. Maybe your family can drop by one of the stores in Houston and send you another sort of care package. The long johns are a lifesaver! I wore a set under my winter clothes a couple of years back during some very frigid December days in Chicago. Just the stuff! Stay warm! Merci, Margaret! Will make a stop next time I”m there! We haven’t tried the fireplace, probably because we don’t have any tools. If Mark were here this week we would be, though! Yes, I am wearing the hats! I followed your lead and went to see George Clooney in “The Descendants” because my husband is out of town. It was so sad…really depressing. But the movie theater was packed, so at least I was toasty warm.